Curious about Social Enterprise? Need to update your branding? Two of our incredible WOMEN members, Kim Harris and Krista Chase, are teaming up to bring you an evening of education, networking and self-promotion. Social Enterprise. Conscious Capitalism. Non-profit. For profit. What is the difference? Consumers are starting to demand businesses think carefully about the social impact they have and the potential for the company to make a greater contribution to the community it operates within. These businesses are now becoming key parts of solutions to things like poverty and climate change. Stakeholders are also expecting non-profits to operate in a sustainable way, with government guidelines changing to require the development of alternative sources of revenue, reducing dependence on government funding. 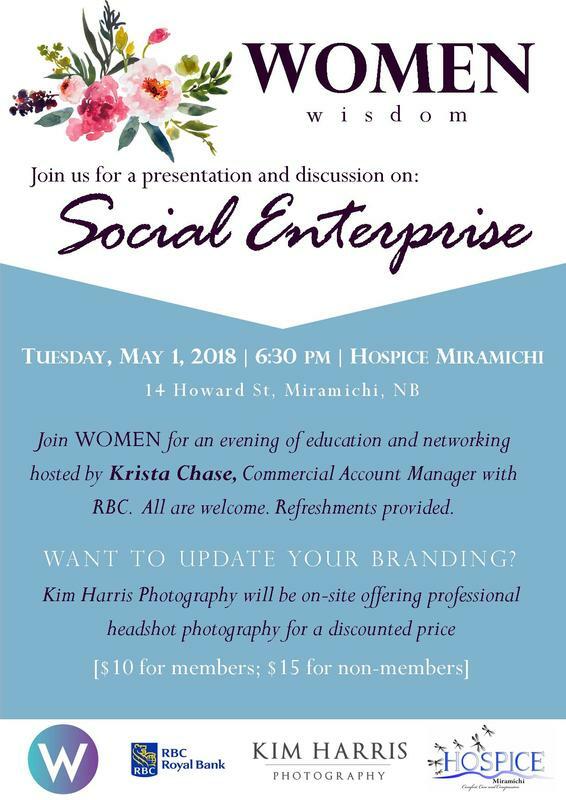 Krista Chase, Commercial Account Manager with RBC will walk us through a discussion about Social Enterprise and the possible impacts for Miramichi. All are welcome! Refreshments will be provided. Please RSVP by April 30th, 2018.